Focault's Pendulum reveals the Earth's movement as the globe orbits beneath it. Our modern understanding of the universe is built upon hundreds of experiments spanning centuries, all designed and implemented by thousands of creative, hardworking scientists. Naturally, a select few of these experiments stand out as especially groundbreaking, because they transform our view of the way things work. A different exercise is to select the most clever experiments — those that uncovered some simple fact of the universe through ingenuity rather than brute force. Without further ado, here are my top five selections for the most ingenious experiment in physics and astronomy — in no particular order. Too bad we didn't have sensitive enough observations of starlight to read the traces of orbiting planets at that time. The exception was pulsars, which form from the remains of some stars after they go supernova. Those objects' almost-unnaturally precise signal, which is caused by beams of radiation jetting away from a rapidly rotating neutron star, could be used to detect the gravitational influence of orbiting exoplanets. The gravitational tug changes the timing of the pulsar blasts in a way that scientists can measure. But how could a pulsar host a planetary system? The violence of a star's final days would surely destabilize any orbits, leaving the local vicinity barren. Apparently, nature doesn't care for reasonable questions like that, because the first exoplanets identified were orbiting pulsar PSR B1257+12. Here's the clever bit: using an oddly precise system generated by nature itself to tease out a difficult detection. It doesn't take much thought to realize that the Earth is round: Ships at sea disappear from view bottom-first, the Earth's shadow during a lunar eclipse is circular, stars that are visible in the Southern Hemisphere can't be seen from the Northern Hemisphere, and so on. Many ancient peoples (at least those who had the luxury of thinking about the problem), including the Greeks, generally seemed to accept that fact. But just how big was that giant orb? Leave it to Eratosthenes, a smart Greek living in Alexandria around 250 B.C., to cleverly measure the circumference of the Earth without even having to leave his city. He knew that a city in southern Egypt, Syene (near modern-day Aswan), experienced no shadows during the summer solstice but Alexandria did. Well, if Eratosthenes knew the distance to Syene, if the Earth were perfectly spherical, if the sun really were absolutely directly overhead Syene during the solstice, and if Alexandria and Syene lay perfectly along a North-South line, then he could use the length of shadows in Alexandria during the solstice to measure the angle between the two cities, and convert that into the planet's circumference using this newfangled technique called geometry. It turns out, all those conditions are close enough to correct to allow Eratosthenes to measure a circumference of about 45,000 kilometers (28,000 miles) — only 10 percent off from its correct value. Not all experiments happen in a laboratory; sometimes you can just think of an imaginary scenario, let mathematics guide you to a conclusion, and — presto — learn about the universe. Einstein was, naturally, a master at this. Because light is made of waves of electricity and magnetism, Einstein figured he would see those waves frozen alongside him as he pedaled furiously. But we don't see frozen waves of electricity and magnetism. Anywhere. Ever. So maybe, instead, it's impossible to travel as fast as a beam of light. Anywhere. Ever. Start with that thought, and do a bunch of math, and before you know it, you've developed the theory of special relativity. Einstein pulled a similar trick later in life, as well. What if you were in a windowless elevator and someone cut the cord, sending you into free fall? Are you plummeting to your death, or simply kicking about in the weightlessness of free space? This experiment, performed by physicists Robert Millikan and Harvey Fletcher in 1909, isn't clever because of its ingenious design or attempts to outwit nature at its own game, but rather because of its simple construction and unflinching honesty of measurement. I also picked it because it doesn't get a lot of airtime despite being historic. Back in that time, scientists knew that electric charge existed, but they didn't know much at all about it. Were there fundamental bits of charge? Or could something have any amount of charge, as mass can? What's the charge on an electron, anyway? So Millikan and company built a device that dripped drops of electrically charged oil through a chamber. Very quickly, the falling drops would reach terminal velocity, which is the maximum speed at which they can fall through the air due to the pull of gravity. If you know the density of air, the density of oil and the strength of gravity, measuring the terminal velocity tells you the mass of the drops. By applying an electric field, Millikan could halt the drop of the drips (or the drip of the drops, if you prefer) and make them hover in place. With the electric force perfectly balanced by the gravitational force, the charge on each drop could be measured. After repeating such measurements many times, Millikan was able to make two conclusions: The charge on a single electron is minus 1.6 x 10^-19 coulombs, and that charge is fundamental — all charges must be built out of units that size (let's not talk about quarks and their fractional charges right now). Want to have a charge of minus 1.9 x 10^-19 or 8.7 x 10^-19 coulombs? Too bad. You're not allowed. Like the curvature of the Earth in ancient times, in the mid-1800s, the rotation of the Earth was generally accepted by people who had the luxury of thinking about such things, but not really talked about or understood in the way we might talk about, say, the antics of the latest reality TV star. Physicist Léon Foucault wanted to change that, and he did so in suitably grand fashion. 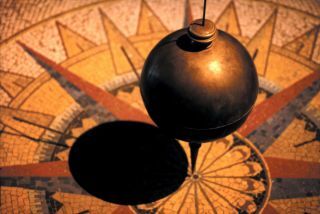 If you leave a pendulum to its own devices (that is, swinging) the Earth literally rotates underneath it while the pendulum maintains its original plane. From our perspective attached to the rotating Earth, it looks as though the ground were fixed and the pendulum were rotating its orientation over the course of the day. In 1851, Foucault set up such a pendulum in the Panthéon of downtown Paris, thus demonstrating the Earth's movement by slowly changing its orientation clockwise — at around 11.3 degrees per hour. It was a huge spectacle, and the media loved it. The demo went viral (well, as viral as it could in the 1800’s), and soon enough, Foucault's pendulum was a mainstay of science exhibits around the world. It was exciting! People were talking about the rotation of the Earth! And that's the clever bit here: making science accessible and something worth talking about. Learn more by listening to the episode "What were the most clever experiments of all time?" on the Ask A Spaceman podcast, available on iTunes and on the Web at http://www.askaspaceman.com. Thanks to @MarkRiepe for the questions that led to this piece! Ask your own question on Twitter using #AskASpaceman or by following Paul @PaulMattSutter and facebook.com/PaulMattSutter.